In response to new emissions targets established by the EU in 2008 that call for an up to 30% reduction in greenhouse gas emissions, a 20% reduction in energy consumption, and the generation of 20% of all power demand from renewable energy sources by 2020, HERA commissioned the construction of a highly efficient combined cycle power plant (CCPP) in Imola, Italy. Since coming online in 2009, this CCPP has generated a total of 80 MW of electric power for the grid, meeting both baseload and peakload demand. In addition, the power station provides a steady supply of hot water for the local municipality. Powered by methane gas from the national distribution network, this highly efficient power station generates power using two 30 MW gas turbines, two heat recovery steam generators (HRSGs), and a 20 MW steam turbine. 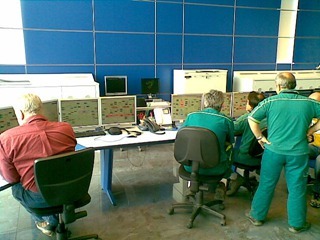 To automate all operations at this plant, Yokogawa Italy installed the Yokogawa CENTUM CS3000 production control system (PCS), Exaquantum process information management system (PIMS), and Plant Resource Manager (PRM) asset management package as well as FOUNDATION™ fieldbus enabled transmitters. The PCS is fully integrated with the power station’s gas and steam turbine systems, an emission monitoring system (EMS), and other subsystems. On average, HERA’s CCPP operates nine months out of the year. To meet both base and peak load demand, the power station must be able to quickly and smoothly scale output up or down, in response to requests from the national power electricity network system. And it must do so while meeting the strict emissions and efficiency targets of the EU. The power station’s two gas turbines generate electricity using methane gas as their power source. Rather than being discharged into the atmosphere, the hot (around 500 deg. C) exhaust gases from the turbines are sent to two HRSGs, where they pass through economizer, vaporizer, and superheating banks to produce superheated steam (50 bar, 487 deg C) that is used to drive a steam turbine, generating an additional 20 MW of electricity. (This is done using solely the thermal energy produced by the gas turbines, i.e. no additional fuel is used.) 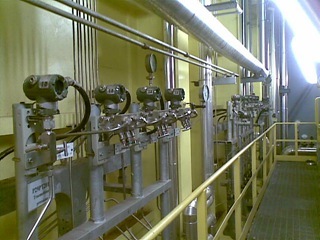 After passing through a reduction catalyzer that removes NOx and CO, exhaust gases from the HRSG units are discharged into the atmosphere at a temperature of approximately 110 deg C. Steam at 1.7 bar and 133 deg C is also withdrawn from the steam turbine at an intermediate stage and sent to a heat exchanger, where it condenses to produce 92 deg C water for distribution to a district heating system. The quantity of steam withdrawn from the steam turbine varies depending on the demand for district heating services. The steam that has been allowed to continue expanding in the turbine to produce electricity is exhausted to a condenser, and the condensate is sent back to the HRSGs. The CENTUM CS3000 PCS supplied by Yokogawa is fully configured to control all of the functions described above, ensuring that HERA can operate this power station safely and stably throughout the year. The HERA CCPP is designed to be operated continuously at full capacity for 24 hours a day, year-round. However, it cannot be expected that this level of operation will actually be achieved as there are practical limits to the reliability of components, and planned shutdowns of principal machinery must be implemented for maintenance purposes. Annually, this power station produces 644.82 MWh for the national power grid and 232.427 MWh of thermal energy for the city of Imola’s district heating system. In 2013, the power produced by this plant met 96% of the estimated energy consumption needs for the city of Imola and four neighboring municipalities. The power station has a high yield (useful power obtained/quantity of heat supplied by gas combustion) which reaches its highest value, 78%, under conditions of maximum thermal energy demand for district heating. In the energy sector generally, and for thermoelectric power stations like this power station in Imola, the most significant environmental impact is the emission of gasses and of other substances that are harmful to the environment. The power station’s principal emissions are exhaust gas from the gas turbines that are released into the atmosphere after yielding their heat to the station’s steam generators. The limits that were imposed in the environmental impact assessment (EIA) procedure have made it necessary to install catalyzers to remove nitrogen oxides and carbon monoxide. The Exaquantum process information management system (PIMS) package installed by Yokogawa Italy gathers many kinds of process data for reporting purposes. For further analysis, event data and sequence of events (SOE) data are gathered from the CENTUM CS3000 PCS and subsystems such as the gas turbine control system, steam turbine control system, and emission monitoring system. 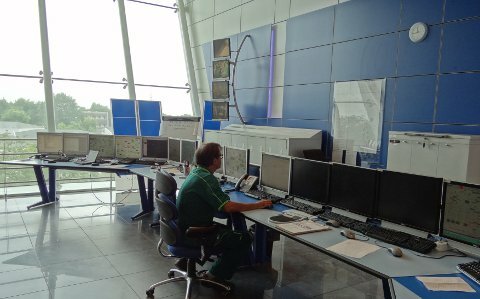 The visualization of data using the Exaquantum PIMS plays an important role in efforts to improve operations at this power station. To reduce operator workload and eliminate unplanned shutdowns, HERA decided on the use of field digital technology at this power station, installing FOUNDATION™ fieldbus field instruments and control valves as well as Profibus motor control devices. Using Yokogawa’s Plant Resource Manager (PRM) asset management package, which is fully integrated with the power station’s CENTUM CS3000 PCS, operators at human machine interface (HMI) stations in the central control room are able to conduct periodic checks of all these field devices. And by using FOUNDATION™ fieldbus FDT technology, engineers can also remotely monitor control valves and other devices supplied by non-Yokogawa vendors. This enables a preventive maintenance approach that spots problems in field devices before they can lead to unplanned plant shutdowns. And by eliminating the need to physically check devices in the field and enabling personnel to easily check parameters when replacing a device, this significantly reduces maintenance workload and costs. Zanoniis Massimo, technology manager at the HERA power station, says, "We applied field digital technology at this new CCPP. There are 24 segments connecting 390 fieldbus devices, and 24 Profibus segments. The integration of the PCS, subsystems, PIMS, and PRM allows this plant to operate steadily and meet power demand at all times. The CENTUM CS3000 PCS has excellent reliability and we are very satisfied with it. We continue to look for new ways to improve efficiency at this power station."